ThriveCart provides you with the ability to easily add custom codes and scripts to your checkout pages. This is exceptionally helpful if you want to add marketing or tracking scripts or if you want to add things like contact widgets or social proof type services. So let’s take a look at these options and where we add these codes. 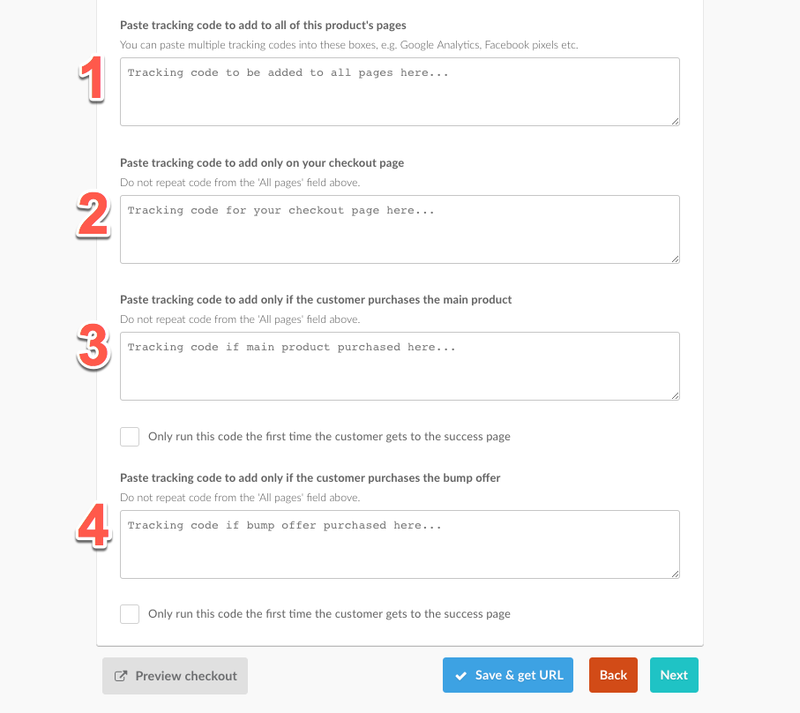 Under your product settings, you’ll want to head over to the Checkout tab and then choose the Tracking tab. Any codes added to this box will be automatically added to all your checkout pages. * This would the box to embed things like base tracking pixels or codes you want to trigger on every page in your funnel. Any codes added to this box will only be embedded on the initial checkout page. This is helpful if you want to fire certain triggers when a customer lands on your checkout page or if you want to add a social proof type service, chat modal or the such. Any codes added to this field will only be embedded on the ThriveCart hosted success page. This is helpful if you want to fire purchase events in your tracking scripts or want something to trigger only when the main product is bought. This box only shows if you have a valid bump offer on your product. Any codes added to this field will only be embedded on the ThriveCart hosted success page. This is helpful if you want to fire purchase events in your tracking scripts or want something to trigger only when the bump product is bought. Your upsell products have similar options. Note that base tracking pixels do not need to be added to your upsell page’s code area as this would typically be added to field 1 above. Embedded codes will still continue to work even when using custom upsell pages. It’s also worth remembering that the codes that triggered when products are purchased are embedded into your ThriveCart hosted success page. If you are using your own custom success page you will need to load those codes yourself. There many variables you can refer to when loading codes on the success page. We use these in our own tracking scripts that we provide for Facebook and Google Analytics. They can be explored via the console (console.dir(_thrive_order);) which break down the amounts paid for individual items like the bump, upsells etc. If you are adding custom scripts and codes to your checkout pages, be sure to test your check out once these codes are embedded. Some third-party platforms ‘inject’ code into your checkout pages which may cause conflicts.